Raleigh-Durham-Chapel Hill, North Carolina, are the three major cities which originally set up the "triangle" that is known as the Triangle Area in North Carolina. These cities border the Research Triangle Park, one of the most prominent business locations on the East Coast. 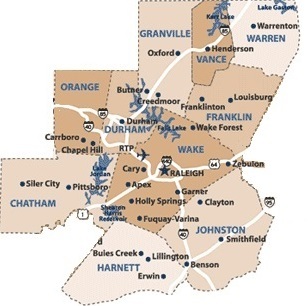 Today, the Triangle Area has a vast array of cities and towns within its "borders," ranging from Oxford in Granville County, to Smithfield in Johnston County, to Siler City in Chatham County, and Lake Gaston in Warren County, and then some. Each area has its own unique lifestyle, community, and landscape. Check out a sampling of information on each of these counties to find the right place for you.